The Fogel family members, who were butchered by terrorists in their home in the West Bank settlement of Itamar on Friday night, were not the murderers' first target. On Sunday, it was reveled that the terrorist cell which murdered the family, first broke into the home of the Chai family, who by sheer luck were not home at the time. "It is a great miracle," said David Chai, after returning home from a family vacation. The Chai family was also planning to host two young couples in their house while they were away, but the guests cancelled at the last minute. "My mom still hasn’t digested this miracle," said Moshe, who was supposed to visit Itamar along with his pregnant wife and baby girl. After returning home Saturday evening from a family vacation in the Jerusalem area, David Chai realized that the terrorists who infiltrated the settlement entered his house first. An initial probe by security forces revealed that the cell broke into the Chai home and searched all the rooms. After realizing the house was empty, they waited for the right opportunity, and quickly walked over to the next house, which belonged to the Fogel family. "It is a great miracle, because we planned our vacation ahead of time, and found out about the attack only after the Shabbat was over. I still find it hard to believe," David said shortly before bidding farewell to his five neighbors who were murdered in the attack. However, the miracle does not end there; Itamar resident Aviel Zegron planned to celebrate his 22nd birthday on Saturday. 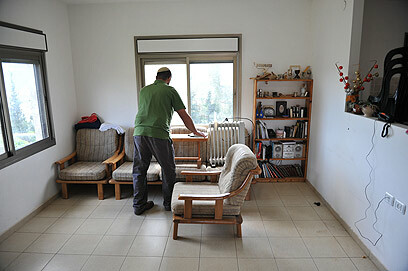 He invited three couples from the Jerusalem area to spend the weekend in Itamar, and asked his friend David Chai if they could stay in his vacant house. "I was excited and prepared for the event," Aviel told Ynet. "We planned to celebrate together, but then I got two cancellations. One of the couples called on Thursday and said they couldn't come because the husband, who serves in the army, had to stay at the base on Saturday. "On Friday morning Moshe called me and told me that his pregnant wife was not feeling well, and that he was taking her to the hospital," Aviel recounted, adding that he was "disappointed by the cancellations." 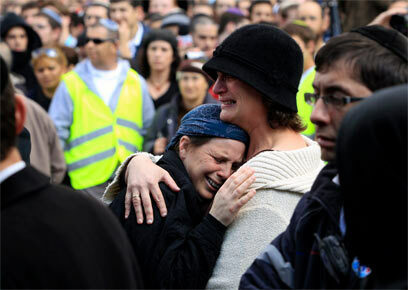 Oshrat, Moshe's wife, suffered from shortness of breath and was hospitalized at the Hadassah Medical Center in Jerusalem. "The doctors told us that if my wife wasn’t 28 weeks pregnant, they would have released her home," Moshe recounted the circumstances that prevented him from going to Itamar – and also saved his life. "Saturday night I got a call from Aviel who told me that the terrorists first entered the empty house where me, my wife, my one-year-old daughter and another couple were supposed to stay over the weekend," Moshe said. Although he was not personally acquainted with the Fogel family, Moshe left his wife's bedside and attended the funeral. "The pain over the loss of the family is immense. There is divine supervision, and these types of incidents make it even clearer. "Tomorrow morning, when we take out the Torah scroll, we will recite Birchat Hagomel (Benediction of Deliverance), because we were only a few hours away from crossing between life and death," he added. Aviel, who lost his brother eight years ago, when he stormed a terrorist during an attack in Ariel, was also among the thousands who came to pay their last respects at the funeral. "My mom told me – you don't know how big of a miracle you just experienced. I've already received a blow in my life, and this is just an insane miracle," he said. See all talkbacks "Itamar attack: Chai family escapes murder"